The definition of resiliency has evolved significantly over time and slight differences persist among disciplines. In general, resilience is the ability of a system to persist. For civil infrastructure systems, resilience is the capacity of an infrastructure system to minimize damage due to a disruptive event, and to recover the pre-disruption performance level within acceptable predefined time and cost limits. 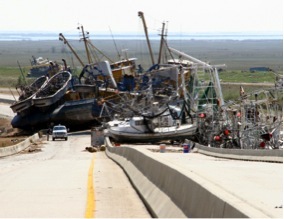 A resilient infrastructure system must be capable of recovering full pre-disruption performance level within reasonable temporary and financial constraints, given that a community depends on such performance to support its own social and economic recoveries and the financial impacts from the disruption have to be manageable with realistic budgets. Research and development efforts on resilience of civil infrastructure systems are important because those systems sustain social welfare and enable economic development. Near-continuous performance of civil infrastructure systems is possible, but requires overcoming significant challenges ranging from the systems’ financial efficiency to coping successfully with extreme climatic events.